Have you always wondered how people make their face glitter look so good and how they get it to stick so well? Many of us get excited when we are exposed to glitter and just loves those highly reflective pieces of shine. Yet, not everyone know how to apply face glitter or are looking for a better way to apply the sparkles. If you’re one of them, keep reading. 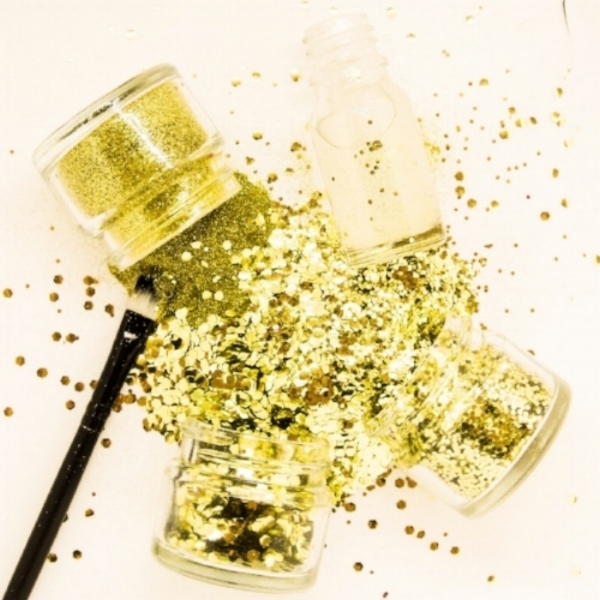 You’re about to learn how to apply glitter in 7 easy steps. Firstly, think about what look you are going for. What type of event is it and what are you wearing? Then, grab your choice of Minimal Glitter, Natural Glitter Primer and a small to medium makeup brush. If you don’t have any of these, I suggest you have a look in our shop to see which one you love the best. Make sure you get your hands on one of the primers as well. When you have all of this, you are ready to go to the next step. Before I tell you step 2, I want to take a moment to introduce our new and amazing Natural Glitter Primer. This is an aloe vera based gel, made of natural ingredients. We have tried many different “primers” but have never found one that we truly love. We tried paw paw oil, which makes the glitter on the face look oily, hair gel which is too sticky (and should probably not be used on your skin) and aloe vera gel, which feels light but doesn’t make the glitter stick in its place for long. The natural primer is the best we have tried and used so far, it has the texture of aloe vera gel which makes it feel nice and light on your skin. It sticks like hair gel, without making it feel too sticky. I’m not telling you this because it’s our own, it is truly the best. 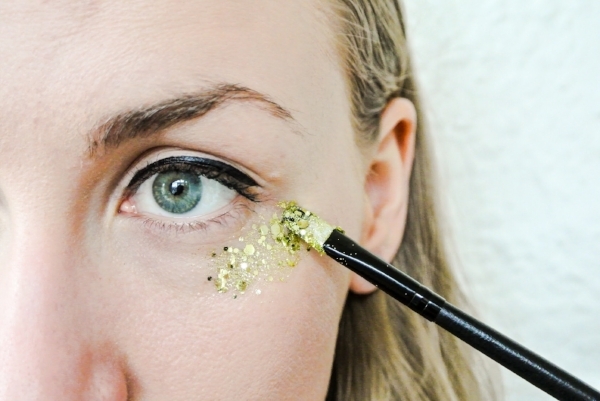 Apply the face glitter on once, and you will have the same look all the way through the night. Apply the natural primer on your makeup brush. If you get too much at once, you can put a little bit on your hand because you will use it repeatedly. Apply a thin layer onto the area of your face where you want to add the glitter. Don’t apply it on the whole area at once, start with a little bit at the time. 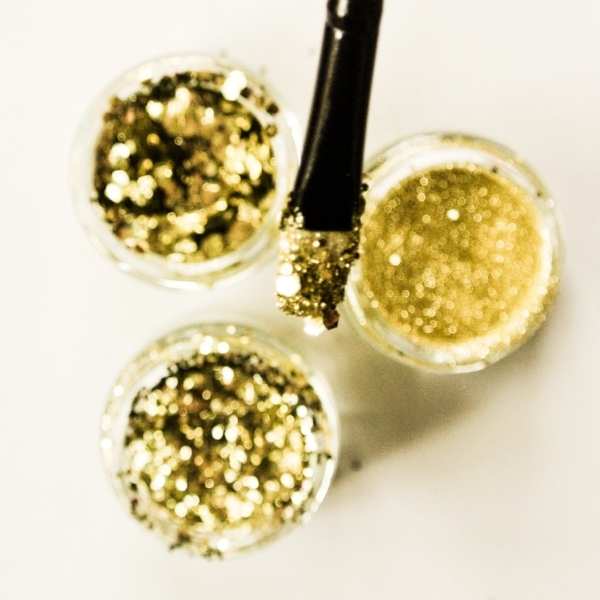 Dip the same makeup brush in the glitter jar, one quick dip is enough if you plan on a subtle look. Use a bigger brush if you are planning to cover bigger areas of your skin, such as your neck and chest as well as for whole face coverage. Now to the fun part. Gently apply the glitter to the area of the face you applied the primer. Work with the makeup brush to add the glitter on the face. Add more primer to your brush and apply it to your face as needed, add more glitter to the brush and transfer it to your face until you are happy with your look. It is that easy. Step 7: Snap a Photo of Your look! We love to see our Minimal creations. Publish your selfie on Instagram and tag #minimalglitter to get a chance to be featured on our page. Wait, Why is Plastic Glitter So Bad And What Can We Do About It?